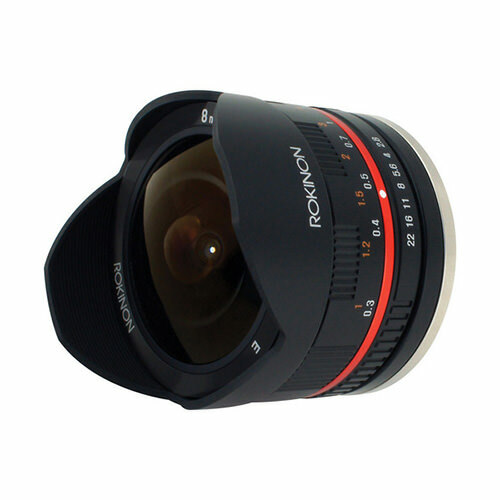 Lens Description: The 8mm f/2.8 UMC Fish-Eye Lens for Sony E-mount - Black by Rokinon is a fast, ultra wide-angle lens designed to work with the Sony NEX mirrorless cameras. Multi-coated lenses equal minimal aberration and sharp images and a built-in petal-type lens hood prevents unwanted glare. The minimum focusing distance is 1' (0.3m) and the angle of view is 180º, offering full-frame (non-circular) images. At 12mm equivalency, this is a perfect lens to explore the creative possibilities of the latest mirrorless cameras.